Today we have another first, my first stick from AVO Cigars, the AVO Domaine #20. I'm pretty excited to give this sweet looking little perfecto a try. Other than a small wrapper tear near the head, this is a great looking cigar. The silky smooth Colorado claro colored shows only the finest of veins and it's rolled on with seamless skill. 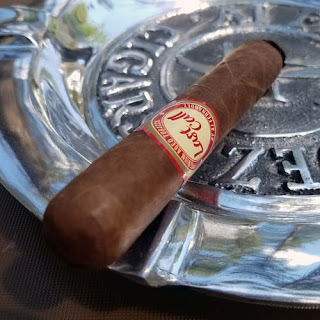 Once the triple cap is clipped the cigar has a pleasant cold aroma of sweet toast. Since it's a perfecto, the draw is supper tight, but it freed up before the burn reached the shoulder. Initially there are medium bodied flavors of toasted cashews, sugar, caramel and toasty tobacco. Around the mid point the body transformed into the full range and a bit of red pepper started popping in and out along with a bit of burnt brown paper bag, some sweet cream, toast and spicy Spanish cedar. The AVO Domaine #20 finished it's forty-five minute burn with another touch of red pepper and flavors of sweet caramel over toasted nuts. Pretty tasty! Around the shoulder area the burn did run off a bit, but it eventually corrected itself. Overall I'd have to say my first experience with an AVO Cigar was pretty good. It had an okay burn, a nice tasting, complex flavor mix, other than the quick blasts of red pepper, it produced a nice burning aroma and it was packed well full length.